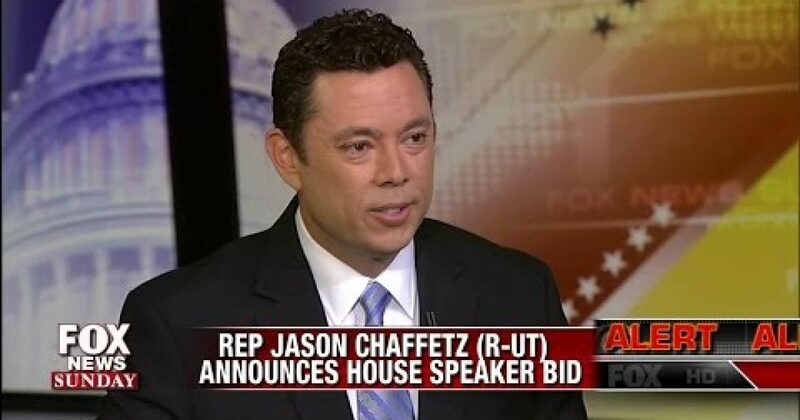 I have to admit upfront, upon meeting Jason Chaffetz (R-UT) at the Obama/Romney debate at Hofstra University in 2012 I became a fan. Actually my admiration started earlier when he was first elected to congress and he spoke about saving money buy sleeping on a cot in his office every night. On Fox News Sunday, the three time congressman from Utah announced he a long shot bid for the Speaker of the House position against Majority Leader Kevin McCarthy (R-CA). His primary reason is that while he believes McCarthy will win the secret ballot vote internally, he does not believe McCarthy can win the open vote when the Speaker gets chosen by the full house. Chaffetz, who is chairman of theHouse Oversight and Government Reform Committee told host Chris Wallace that Republicans would be getting more of the same with McCarthy, referring to the controversy which pushed present Speaker John Boehner to retire. Whether or not McCarthy is more of the same is not as big an issue as what he proved this week, that the guy is as prone to gaffes as the SCHMOTUS, Joe Biden. McCarthy in-artfully gave the impression that the Benghazi committee and the Planned Parenthood hearings were politically motivated. Even if it were true (it’s not) it was just a stupid thing to say. Just imagine the opportunities to say stupid things if he became speaker. Rep. Jason Chaffetz has officially launched his dark-horse campaign for House speaker, arguing he’s a better choice to unite the fractious Republican conference and that Majority Leader Kevin McCarthy lacks the communication skills and credibility with conservatives needed to succeed in the top leadership job. But McCarthy has broad support within the Republican caucus and remains the overwhelming favorite to succeed outgoing Speaker John Boehner (R-Ohio). While Rep Webster (R-Fl) has announced also, Chaffetz has more stature and represents a bigger (but still long shot) threat to McCarthy. This week’s vote for speaker is going to be very interesting. Below is the Chaffetz vote on Fox News Sunday.